By Rebecca Nickols on April 7, 2013 Visit Rebecca's Website. Why I undertook this project was twofold: I not only enjoy the domesticated birds in my backyard (chickens), but I’m also passionate about the native birds that visit my property. 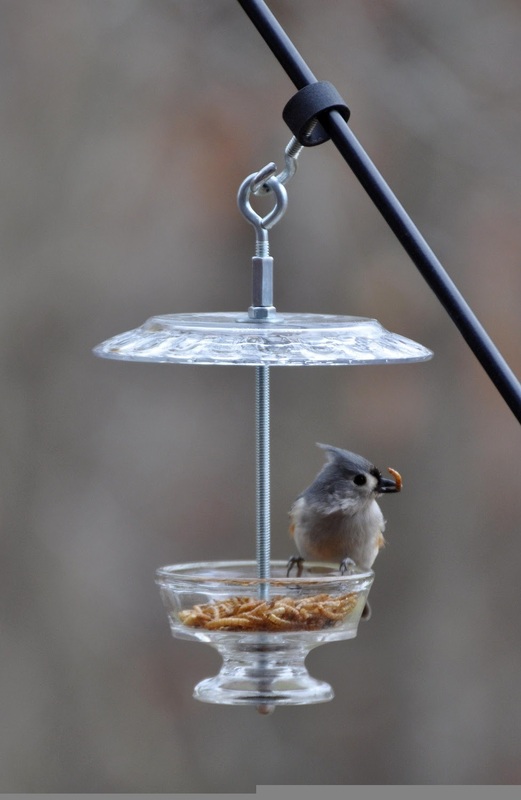 Though putting out bird-feeders is enjoyable, you can actually attract twice as many birds to your property by providing them with their natural food sources; nuts, seeds and berries from native trees, shrubs and wildflowers. In a presentation that I recently gave at our local lawn and garden show, I demonstrated how you can design a garden that will not only attract birds to your landscape, but will also provide a year around habitat meeting their basic needs of food, water and shelter. But.. feeding the birds by offering a variety of birdseed in an assortment of feeders is how you get those up-close views of the birds we enjoy. Mealworms are popular among bird-feeding enthusiasts as a way to attract many insect eating birds that are not usually attracted to birdseed. Bluebirds are particular fond of mealworms, but so are wrens, robins, jays, sparrows, cardinals, woodpeckers, nuthatches, titmice and chickadees. 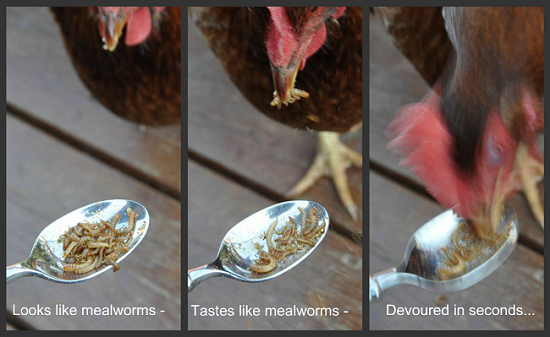 And among chicken enthusiasts, mealworms are rated as the top choice in chicken treats! It’s of my opinion that we shouldn’t offer our flock an excess amount of any treat. Most of their nutrition should come from a high quality feed or natural food sources that they have foraged for; grubs, seeds, insects… Offering a treat though is a great way to train your flock to come to you when you call them or to coax them back into the coop at the end of the day. Not to mention the fact that it’s fun to watch them fight over the kitchen scraps! The first phase consisted of the set-up, purchasing the initial mealworms, feeding them and watching them evolve into 1000 darkling beetles. I started this project in September and around December I had a container full of beetles and I was stuck in that phase for a few months. Then in February I noticed that all of the beetles had died (and smelled a lot). I was ready to throw the whole thing out when I realized that under the beetle carcasses and in the bedding were thousands of tiny mealworms! Since I was following a “one container” method of raising mealworms (see this link: How to Raise Mealworms), I left the dead beetles and added in extra layer of wheat bran to diminish the smell… I speculate that my original mealworms that I purchased were the same age, went through metamorphosis and died as adult beetles at the same time. Each female beetle can lay up to 500 eggs in her lifetime, and I now have mealworms that vary in age and size. I cannot even estimate how many mealworms I now have, but it’s more than enough to share with the wildbirds and my hens. The third phase in this DIY will be when I have mealworms and mature beetles in the container together… Actually apart from the odor (which really isn’t that bad), this DIY has been easy. The hardest part is the wait – about five months from start to harvest. I also like the “hands-off” technique of this method; I’ve never had to separate or touch the beetles. All I do is feed them a couple of times a week and now I scoop out a few mealworms and give my flock a fresh “homegrown” treat! We’ve grown a small amount of mealworms, nothing as large as your venture. Besides our bask yard flock, we grow them for pet lizards and my hedgehog. My hedgehog Addi always seems to hid away a couple of worms so she can eat the beetles. I actually think she might like those better (crunchier)! I ordered 200 larva. As they changed into pupa I removed them into another container. When they turned into beetles. I moved them to another container. I left them in that container for 3 weeks then moved them again into another container. Actually I put back into the first container. I now have two containers with larva and one with beetles. I think I will try growing them altogether. It would be easier I think. My girls would love the worms and flakes! This contest has ended and a winner has been chosen! Thanks for all your comments and good luck raising your own homegrown chicken treats! I’ve raised mealworms for several years for my bearded dragon and iguana. I use a 10 gallon fish tank with a screened top. They are very easy to raise, with potatoes for food. I had not thought of also using them for outdoor birds, but think that is a great idea. I’d love to try this. I enjoyed fermenting feed for my chickens, ready to start another project! Thanks for the opportunity. Going to try this soon. Sounds just as easy as my vermi worms I have in the basement. My ladies like those too! My chickens go crazy for mealworms. if ever I am having trouble getting them to go back into the kennel, I go get the bag of mealworms and they follow me anywhere. Sometimes, though, they hear rustling and think I have mealworms when I don’t; then I feel bad. This is so on my chicken “bucket list” of things to try! My chickens love the freeze dried meal worms but they are very expensive! I believe I will try to raise my own! I have been thinking of trying to raise my own meal worms for my flock. We have 18 chicks that are just now 5 weeks old. Good time to start I think!! Where is a good place to get the wheat bran and starter meal worms? Can you just use meal worms from the fishing department? sjills12@yahoo.com would love to win! I’m going to try this. Has anyone tried raising soldier fly larvea? Like this site very informative!!! In the past, I have purchased mealworms for the Eastern Bluebirds that nested on our property. I have considered raising mealworms myself but was unsure of how much work it would take. After reading this great post, I might look into it seriously. I would love to start another colony of mealworms for my birds to enjoy. They are super easy to raise and fun to watch your birs enjoying the treat. My hens love mealworms. They will follow me around after a treat just to make sure I don’t have anymore. It’s like steak to a dog. I started this last month and I am already seeing tiny white beetles in the bin. will these turn larger and dark? would enjoy winning yours for my girls. I just got my 2 girls a little over a week ago. After I tackle raising them, I’d love to raise the mealworms for them and all the birds that come around. lipstick007@rocketmail.com – have an eggselent day! I wish I had the patience to wait five months! My girls have not tried meal worms. I try to let them get their nutrients from grazing on our small plot of land. Bet they would love meal worms.They go crazy over grub worms when I plow the garden. I did not know about this, I am going to work on myself, the gross part of “mealworms”, to do this for my chickens. Please enter me. While I don’t presently raise meal worms I have in the past. If you want to do an interesting experiment with feeding them just put a slice of apple alongside a slice of potato and watch what happens. Great article and comments are all very informative too. Hope I win those meal worms. I like to feed my birds but I’m not sure I have the stomach to raise them myself. I bet my chickens would love these! Now I just have to get past the gross factor. One can never have enough mealy worms! Please enter me too. How neat! 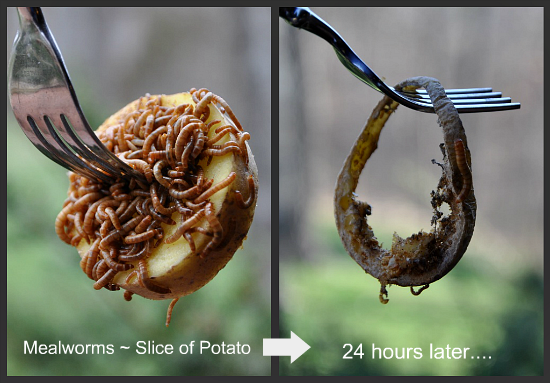 I know my chickens would love them, but I am still feeling a little too squeamish to venture into raising our own meal worms just yet. I have been wanting to do this because they are so expensive. This is a great idea. Ihave always just bought worms for my free range chicks. now i’m gonna raise my own. I was given a bucket of chicken manure for my garden, but it was so full of these worms that I was afraid to use it. Would it have been okay to use around my plants? I don’t have chickens, so I had no idea they liked the worms. Always thought about growing meal worms but never figured out how. Would be great to give to my flock during the long winter days here in Minnesota. Thanks for the great articles. I grow my own mealworms in 8 rectangular plastic containers about 18 in W x 36 in L x 8 in H. I stared by buying 1,000 mealworms by mail and used wheat bran from the feed store as their bedding/food. I give them potatoes for moisture as needed (it will vary with the stage that they are at). It’s so nice to have a variety of sizes of worms – little ones for the peepers, big ones for hungry hens). The colonies have self-propagating for a couple years now as I don’t take all the worms from any one container. When I see more chaff (worm poo) than barn, I sift out the chaff into a clean 5-gal bucket and put the rest back into the rectangular container. The chaff is the best garden additive ever! My chickens love the dried mealworms but have not given live ones! Could be a fun project for my kids. Thanks for information. My chickens really love meal worms, but adding one more thing I have to watch over might put me over the edge. So my girls are really hoping I win. I occasionally buy dried meal worms for my girls, but it can get expensive. I would like to try raising them one day. Thanks for the information. My girls hope I win. This is amazingly great. Phenominal. I am going to try. I REALLY HOPE I WIN WON OF THESE!! I have been having terrible luck. I’ve raised mealworms in my classroom before, but not 1000 at a time! I would love to attempt growing them for my chickens at home someday. Thanks for the great information and links! This is great, I’m going to try this! I would love to try this! I spend alot of money on those freeeze dried meal worms for my girls. I call them “chickie cheetos” because they crunch like cheetos when the girls eat them. All I have to do is say “who wants chickie cheetos?” and it gets them scrambling. I am trying this!! I just ordered my mealworms. I will be using the three drawer method. I just bought 500 mealworms to start raising my own in a shoe box size Sterlite container. A few have already morphed into beetles. I have put apple pieces and banana peels in the box, but will try slices of potatoes. I plan to start the three drawer system and keep expanding! I have seen a few bluebirds in my yard and neighborhood, so I am hoping to entice more of them to my yard. I’m also going to build some bluebird houses. 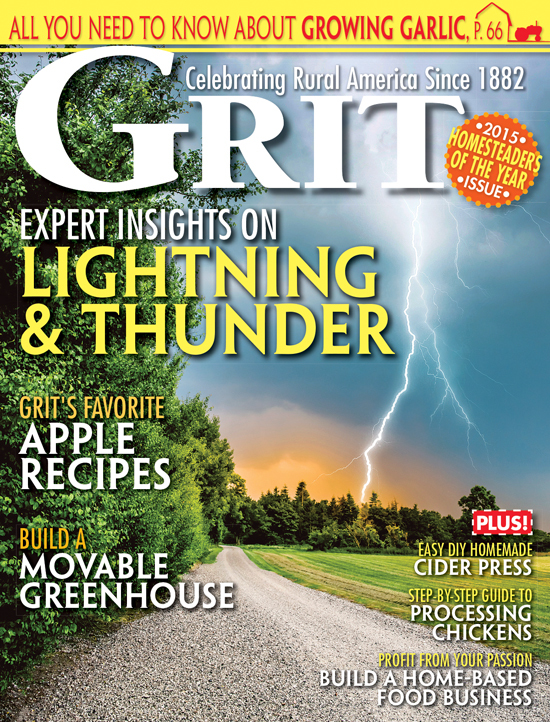 Thanks for a wealth of helpful information for the novice mealworm grower! My friend is raising them in a three drawer system wiuth oats. This is a very interesting project. My boys would probably love this!! i have been raising mealworms for the last 3 yrs. i use plastic boxes and bran. i feed them sliced potatoes and banana peelings. sometimes i put sliced carrots. it took me a little while to get enough but now i can make a new batch when i am running low and they will be ready when i need them. i use them to start off my baby turkeys and chickens and to gentle them down. i feed them to the adults occasionally. they are so easy to raise. i kept them in my washroom. So far, I’ve only fed my birds the dried mealworms that I purchased. I would have to try the 3-bin method in one of those rolling “dressers”, because an open pan would be an invitation for mt cats to start digging!! Just when I thought all I had to do was raise them and collect eggs – now I have to give them treats. I am going to give this a try, but some treats would be great until I actually get there. I’m so glad you posted this! I’ve been searching for information on how to raise mealworms for my chickens and haven’t had much luck! I want to get away from feeding store bought foods as much as possible and I wanted to utilize this as a protein source. Thanks for sharing. Sounds interesting and my girls do love them so. It would be fun to see the whole process. Thanks for the great info. Have been babying the larvae of a 5000-count order of mealworms and just saw my first couple of pupae the other day! This is almost as fun as hatching chicks!! 🙂 THANKS for the great tips. I think I may have to do this! My chicks love it when I find a big juicy grub to give them and know they would like this treat also. I’m doing the multiple bin method as I understand the beatles love to eat the pupae.I have the set up out in the shed next to the coop. The 1000 worms I bought a month ago are growing and tho I check every day I haven’t found any pupa yet. Thanks for the give away because my hens love them some worms!! I guess I better go read the Part I of this story. My little chickens love their mealworms!! Thanks so much!! Well we’re about to get some chicks so I guess this is part of the deal! I’m in! we are just about to get chickens (just bought our first house) and im looking for all sorts of new tricks!! If anyone is interested…last fall we started selling our mealworms on our website at http://www.fishcreekmealworms.com. I started out like most of you raising my own mealworms for our backyard chickens. They are fairly easy to raise but you do have to be patient, our worms that are big enough to feed out right now hatched just before Christmas! And by the way…the beetles and worms do not smell. If you find that your colony is stinky it is most likely because the veggies you are feeding them have begun to rot in the containers or you have dead beetles or worms that are rotting. Feed the colony only the amount of veggies they can consume in a day or two then remove any leftovers promptly. Keeping the moisture level down will help prevent a smelly colony. I’m not ready to have a bunch of beetles in the basement (I can just imagine one of the kids leaving the top off. Shudder.) But… I’d love some treats for the chickens. Awesome! I started my mealworm “farm” in January. Looking forward to the harvest!!! Great article, thanks! What we do for our friends. My girls love their mealworms! We are ready to start raising them, thanks for the advise! I use mealworms for toads and lizzards in my house. We have had beetles happen in the lizzard tank. Can’t wait to try this. Cool! The girls will be so happy! I have tried raising black solider fly larva without much success, but am going to give it another try. I recently read an interesting article about raising maggots for an aquaponics set up, but I’m not sure I can bring myself to raise them, raising meal worms for my chickens and native birds sounds like an interesting project though — may have to give this a try! I am still abit squimish about raising the meal worms for my chickens…but they do love the treats I give to them. I have to give this some thought. sounds like it takes awhile but all worth it in the end. I have been buying the small cartons of mealworms that most people use for fishing. It gets a little expensive. I am now going to use this information and start raising my own. Maybe I can sell a few to my neighbor who fishes! What a great idea! I am going to try this. I have just discovered small mealworms in my containers. Looking forward to being able to give my chickens some treats! I’m going to try the multiple container method. I have the containers and a 40 pound sack of organic wheat bran, so now I just need to take the plunge and order the meal worms! That site didn’t work for me. i think the pricing is a bit off on the rainbow site. This looks like a feasible feat. Our 3 new hens would love these! The perfect article for a project we have been wanting to do! Our chickens love the “tasty to them” treat! Thanks for sharing! I’m not ready to raise my own but my chickens LOVE mealworms! I am trying this…..I am in the all beetle stage….waiting. I use the three drawer method.